Penn Jillette of the magician duo “Penn and Teller” has given an interview (back in 2005) to NPR on why he does not believe in God. Along the way, he evinces some misunderstandings and fallacious appeals. What are those misunderstandings? First, Penn claims atheism is “not believing in God.” Aside from the fact this is the non-traditional definition, it also ignores the fact that theism is the proposition “God exists,” while atheism is negating that proposition. The position he describes more closely resembles that of classic agnosticism. Further, he fails to distinguish atheism from agnosticism on this view (what makes one different from the other on this view?). Next, he oversimplifies when he claims one cannot prove a negative. First, this is self-refuting, for “one cannot prove a negative” is itself a negative proposition. So, either it is false or we must conclude that “one cannot prove a negative” strictly cannot be proven. In either case we need not believe it. But perhaps what he really means is only in the realm of existence. That is also false. If a being can be shown to be incoherent, then it is logically impossible for it to exist, and hence one has proven that being’s non-existence. Perhaps then Jillette would say God’s existence is coherent, but yet one cannot prove a logically coherent being does not exist. As his example, he postulates an elephant in his trunk. Yet such a being is defeasible in the sense that all one must do is open the trunk. That is one way to prove a being does not exist; if the parameters are of a sufficiently limited scope, one may examine those parameters and see if such a being exists. He then proposes to redefine elephant to include abstract properties and a “spare tire.” But in that case we can still prove the non-existence of a being. If a being has the essential property of being a spare tire, and there is no spare tire in the trunk, then there is no such being in the trunk! 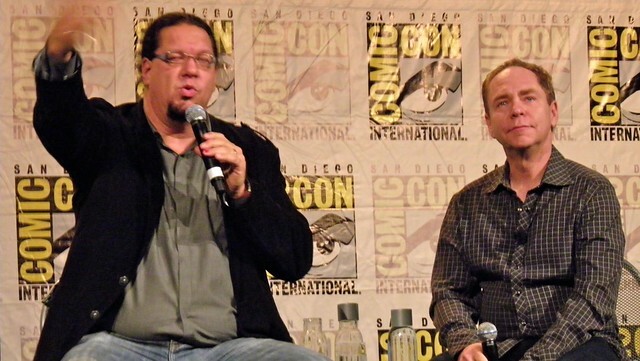 Third, Jillette admits his belief that no God exists is a leap of faith. The reasons he gives for not believing in God are mostly pragmatic and are at times puzzling. For instance, he offers that his atheism does not prevent him from being happy. But why think that what one ought to believe in order to be rational comports with happiness? Or that if a belief makes you happy, it therefore ought to be considered true, or at least not plausibly false? He also claims atheism prevents him from being solipsistic. This is truly baffling, as there seems to be no link between belief in God and belief in other minds, except to say that if one believes in God then he believes in other minds! He continues on to set a straw man, implying Christians claim belief in their “imaginary friend.” I know of no Christians who think God is imaginary. He sets up a false choice between no God and a God who “causes” suffering. He simply does not bother to show why this must be the case. He then claims that no God means the possibility of less suffering in the future. But this is not at all clear. After all, on atheism, sooner or later, man will go extinct and the heat death of the universe will take over. Ultimately, suffering and death win. There is no physical possibility to avoid it. Penn’s view is really just rhetoric, and not particularly good rhetoric at that. It’s what passes for New Atheism these days. Interestingly, this track admits the first premise of the modal ontological argument, and hence God must exist of necessity. It is unlikely Jillette recognizes this problem. It is also not at all clear he understands the meaning of the term from the paragraph in which the term appears. You said: "First, Penn claims atheism is “not believing in God.” Aside from the fact this is the non-traditional definition, it also ignores the fact that theism is the proposition “God exists,” while atheism is negating that proposition. The position he describes more closely resembles that of classic agnosticism. Further, he fails to distinguish atheism from agnosticism on this view (what makes one different from the other on this view?)." Reply: I'd love to see you do a blog (if you haven't already, sorry for not looking thoroughly), going through specifically just why you disagree with this position, perhaps engaging atheist philosophers (Michael Martin comes to mind) who have tackled this issue (is atheism linked or wholly seperate from agnosticism)? The difference between belief and knowledge etc? If only so I know next time I know what not to say to get slapped around like a school girl in debate (just joking.. sort of). Sorry to just stop by to give you homework :) Feel free to ignore. I really never knew much about Penn (and still don't, honestly) beyond a few televised magic performances. I saw this video a few weeks ago of him speaking about why he does not respect believers who do not evangelize (he may have said proselytize), and I thought it was a very honest and humble affirmation of the great commission coming from a self-proclaimed atheist. Of course, I saw this video today and did a facepalm (it didn't so much change my previous view of Penn's video, but I found it annoying that this particular group of Christians automatically assumed it to be just another magic trick and a ploy to promote atheism). Sorry to detract from the philosophical aspect of the conversation. Can you provide a link to the interview? Thanks RoBe. I have addressed the issue, but turns out only in emails, facebook messages, and forums, not at all on this blog! I probably will do a blog post on the issue soon. Although it's worth saying I don't mind people who are agnostic calling themselves atheists, so long as : a) they explain what they mean specifically, b) they do not try to claim that God does not exist, and c) they take whatever pains to ensure that regular people who encounter them do not get the impression they believe "God does not exist." Thanks Raydancer. I can certainly appreciate that as well. You said: "Thanks RoBe. I have addressed the issue, but turns out only in emails, facebook messages, and forums, not at all on this blog! I probably will do a blog post on the issue soon." You said: "Although it's worth saying I don't mind people who are agnostic calling themselves atheists, so long as : a) they explain what they mean specifically, b) they do not try to claim that God does not exist, and c) they take whatever pains to ensure that regular people who encounter them do not get the impression they believe "God does not exist." Reply: Actually, having said this ^^^ you may not need to write the blog, these were the views I was most curious about your perception on, and I gotta tell ya, you and I are in pretty much exact agreement. Thanks for the link, Randy. Something Penn said caught my attention: "I can read ideas from all different people from all different cultures. Without God, we can agree on reality, and I can keep learning where I’m wrong." This seems to be a common idea, as a skeptical friend has said something very similar to me. Have you ever read anyone thoroughly take on this misconception? I have not, but probably because it's so manifestly absurd! I don't mean to be rude, but it just doesn't seem to make any sense. Especially since God is typically posited to be the ground of all reality and truth, it seems we can agree on truth independent of whether or not we regard God to exist, and hence God's existence (or its positing) has no bearing whatsoever. Before rejecting the supernatural altogether, we should consider the following fact. God is said to be spaceless, timeless, changeless, immortal and all-pervading. As per atheistic scientists God does not exist. And we also know very well that atheists do not believe in any kind of God. So according to both of them God is an imaginary being. But science has treated this imaginary God as real and shown that all the above five properties of God are actually scientifically explicable. Yes, with the help of the findings of special theory of relativity all these properties of God can be very nicely explained. If God is really imaginary, then why has science taken so much trouble to explain that imaginary God? So here either particular science is faulty, or if science cannot be taken to be faulty, then God is not imaginary. Science is neutral, but scientists are not. I have a question about the definition of the word 'agnostic'. I see people on the internet saying things like "on the question of God existence, we are all agnostics since none of us can know for sure whether he exists or not." Is this really the correct definition of the word though? Does one have to be 100% certain God exists in order to be called a theist, or does one have to equally certain God doesn't exist in order to be classified as atheist? Seems to be a rather strange defintion of 'agnostic' to me. Your thoughts? Yes, this is a non-traditional definition that would seem to show that the new definition of "atheist" is interesting. After all, theists and atheists (just substitute whatever you'd like to call people who claim God does not exist) cannot *both* know that their position is true, since these positions are mutually exclusive and one cannot know what is in fact false. Thus, at *most*, one side knows and the other is mistaken, even if justified. Thus, if agnosticism is merely about knowing, it necessarily excludes one side or the other, and must remove justification for the remaining side (lest they be said to know). But how do they do this? In this case, it looks like they make the standard "know for sure." But notice this: it opens the door to a distinction between "know for sure" and "know" simpliciter. Only by conflating these two concepts can one eliminate the theist's (or atheist's) justification. But why should we think that in order to know any proposition p, we must be certain that p? I am not certain that in order to know any proposition p, we must be certain that p, and thus I cannot be said to know such a proposition. I wonder how many people are in the same boat? Further, even if someone insists they are certain this is the case, we still have the problem of hard skepticism, where we eliminate vast amounts of knowledge that we normally can be said to know. This counts against their claim greatly! In short, we need to be given good reason to think this!